Kidney transplantation (KT) is the principal treatment of end-stage renal disease (ESRD) because it improves patient survival and quality of life compared to dialysis. Living kidney donation (LKD) is the main strategy to overcome the organ shortage since the procedure is relatively safe for the donors and has improved graft survival with respect to cadaveric kidney donation (CKD). 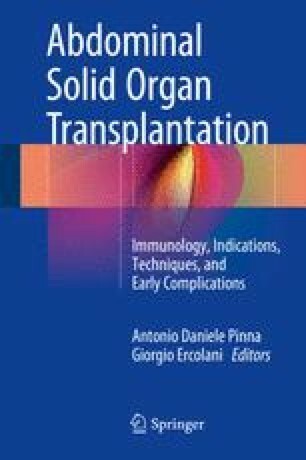 There are many different surgical techniques for living donor nephrectomy, and over the years laparoscopic nephrectomy became advocated by many high-volume centers, but donor safety and recipient outcome still remain the principal end points for any surgical strategy. Concluding, an open minimally invasive or laparoscopic approach is now considered the best option for living donor nephrectomy. The choice between minimal invasive and laparoscopic, and between the different laparoscopic techniques, should be based on the local expertise of the surgeons. Wilson CH, Sanni A, Rix DA, Soomro NA. Laparoscopic versus open nephrectomy for live kidney donors. Cochrane Database Syst Rev. 2011 Nov 9;(11):CD006124. doi: 10.1002/14651858.CD006124.pub2. Nephrol Dial Transplant. European Renal Best Practice Transplantation Guideline Development Group. 2013;28: ii1–71 doi: 10.1093/ndt/gft218 http://ndt.oxfordjournals.org/ at Oxford Journals on 4 Oct 2013.